This has been the year of the purple vegetables. I haven’t even attempted to buy the usual ones yet—purple cabbage and cauliflower, or even purple wax beans—but I’ve worked with purple carrots, purple bell peppers, purple dragon beans, purple hull peas, and purple baby eggplants already this summer. 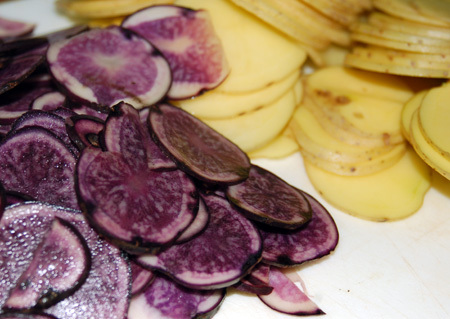 And here’s another to add to the list: purple potatoes. I noticed these little guys, simply labeled “blues” at La Terra Vita’s booth at the Salem Saturday Market, but as I pass them on the way out of the market, it took a few weeks before I walked by with some cash still in my wallet to purchase them. I first tried roasting them simply in chunks with fingerling potatoes and baby carrots, where the striking color contrasts enlivened a rather boring-looking plate of chicken sausages with apple-onion compote and homemade sauerkraut. 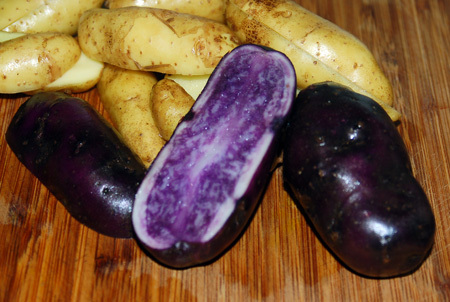 As you can see, cooking these potatoes causes their color to change from deep purple to something much closer to blue, hence the name above. 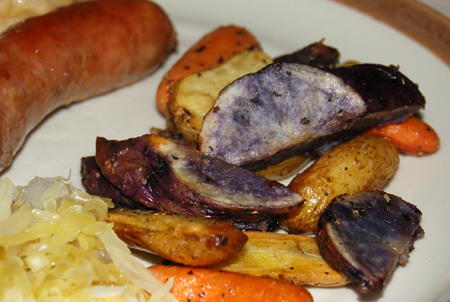 I also had some idea to use the purple potatoes to brighten up a gratin, and I ended up alternating Yukon golds and the purple slices in a batch of muffin-cup gratins, topping each with the latter, of course. The gruyere browned up quite a bit, so the coloring was not quite as striking as I had pictured, but they still tasted great. 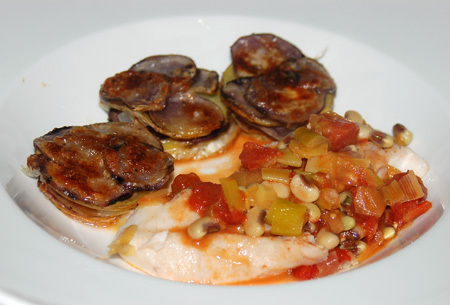 I served my purple potato gratins with braised rockfish in a light broth of tomatoes, leeks, and my remaining purple hull peas (shelled from about 1/2 lb of pods). The recipe came from a readily-adaptable braised monkfish dish in The Zuni Cafe Cookbook that originally called for tomato, fennel, cannellini beans—and monkfish, naturally. It was delightful the first night, with flaky rockfish in a pool of butter-enriched broth, topped with sweet, tender leeks and the creamy bite of the hull peas. But I almost liked it more in leftover form, using equally leftover fried fish from tacos (soggy breading discarded first) and adding enough freshly made chicken stock to create a sort of tomato-based fish chowder that we served over rice. Heat about 2 tablespoons of olive oil on a large saute pan over medium low heat; add the leeks and a pinch of salt, and saute until tender but not browned, about 10-15 minutes. Add the white wine and raise the heat enough to boil briefly, then add the tomatoes with their juices, garlic, chile flakes and saffron (if using). Simmer for about 5 minutes, then add the chicken stock (or fumet, or water) and the hull peas; cook, covered, for about 20 minutes, until the beans are tender. Nestle the rockfish fillets down into the sauce, cover, and simmer gently for 5-10 minutes, until the fish is flaky and cooked through. Gently remove it to your plates with a fish turner. Turn off the heat and add the butter to the saute pan; stir to melt into the sauce, giving it a slightly thicker, glossier texture. Scoop some of the sauce over each piece of rockfish and serve with purple potatoes, if you can. Serves 4. Source: Adapted from The Zuni Cafe Cookbook , by Judy Rodgers (pp. 326-328).